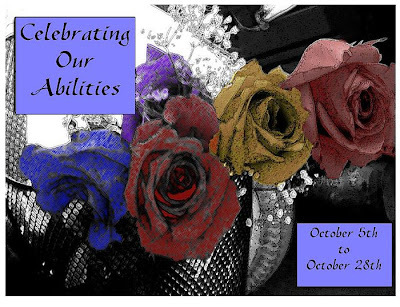 One Mom's Moxie: Celebrating Our Abilities Giveaway - Lots of Prizes!!! Celebrating Our Abilities Giveaway - Lots of Prizes!!! It is a Non-Contagious, Non-Fatal, and Inherited Disease. Celebrating Our Abilities is all about everyone celebrating what they can do and not what they cannot do. It takes effort sometimes, but thinking positively can make such a difference in ones life. It can change your vision of who you are as well as raise your self-esteem because people can see a difference when you are happy with yourself and who you are. So, don't be discouraged! Everyone has their strengths and their abilities that make them blossom and do good in the world!